50 Super Epic TV Moments – A two-hour countdown of the 50 most outrageous TV moments since 2005 (Why 2005? Seems so random) includes the infamous smoking baby in Indonesia, Sandra Bullock‘s liplock with Scarlett Johansson at the 2010 MTV Movie Awards and this year’s William & Kate royal wedding. 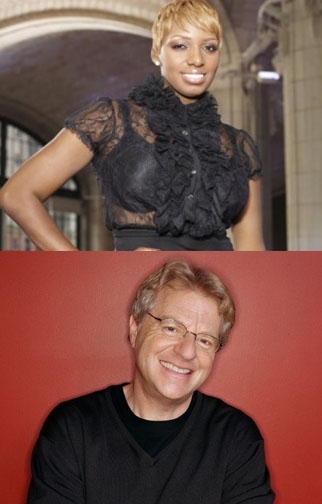 Among the talking heads who chat about the “shocking” moments: NeNe Leakes and Jerry Springer. Burn Notice – Michael helps a woman who’s trying to locate her cousin, a victim of a human trafficking ring, but it becomes personal for him when Maddie gets involved in the case. Extreme Chef – A juiced up version of Dinner: Impossible finds groups of chefs competing in ever more challenging cooking contests each week. First up, the cheftestants are dropped off in a California neighborhood and tasked with whipping up dinner using unmarked canned goods. Their only resource for cooking gear: knocking on residents’ doors. Futurama – Bender, dead?! Sorta. Real Housewives of New York City – Jill and Kelly wig out about what they claim is strange behavior by Simon, and, of course, go running to Alex about their issues. Wilfred – Jenna needs to get Wilfred to the doggie doc, so, to get on her good side, Ryan volunteers to take him. But that requires tricking Wilfred, whose trust is not so easily re-earned. Louie – On the way to a “non-date,” Louie has an upsetting experience. But hey, it provides a good conversation starter. Ugly Americans – In an episode cleverly-titled “Wet Hot Demonic Summer,” Mark oversees the opening of a summer camp. Children’s Hospital – Dr. Von Sydow has a little mix-up in the maternity ward, and the hospital gets a new (pediatric) plastic surgeon. – On True Life (10PM, MTV), heartbroken people try to reunite with their first loves. – Last Call with Carson Daly (1:35AM, NBC): Florence & the Machine.